False Bay was covered in breaking 2m waves and the wind, already 30kts, seemed to be strengthening. But the worst problem was that it was already almost dark. 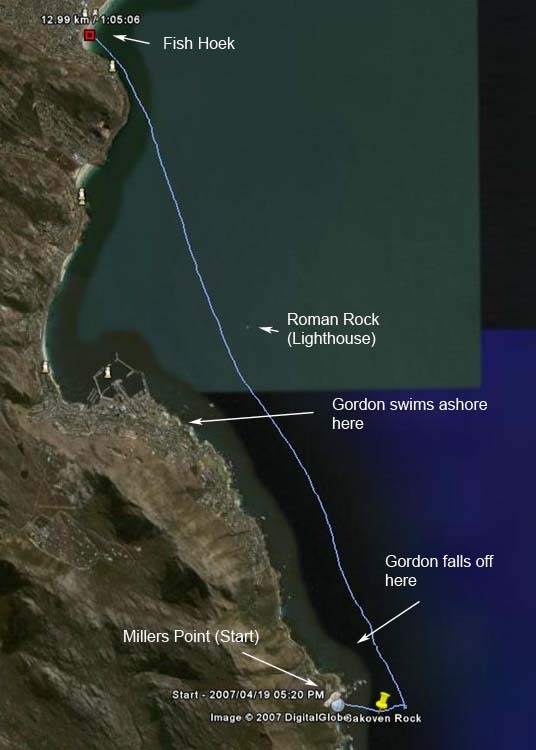 And as I paddled into Fish Hoek at the end of what should have been a classic downwind run, I was frantic with worry - I was almost certain that one of the group was off his ski, in the water, about ten kilometres back near Millers Point. I love the Millers Run - we do it whenever the southeaster blows, which is pretty much all the time in summer. As autumn arrives though, the southeasters become few and far between and we try our utmost to squeeze every run in, sneaking out of the office early so that we can start in time to finish before dark. On Wednesday 18th April conditions were ideal - but it was getting dark as we arrived at Fish Hoek and we agreed that perhaps we were pushing our luck a little far. The southeaster was forecast to blow the following day and we agreed that we'd meet a little earlier, at 16:30 to be on the water by 17:00 at the latest. Thursday arrived and three of us, Damian, John and I met at Fish Hoek. We've all done the run many times and have confidence in each other's capabilities. When we arrived, Simon introduced himself and asked if he could join us. He's a vastly experienced paddler (about to set off on a 30,000km round-Africa paddle in December - but that's another story). John had also invited Gordon. I knew Gordon from races but had never paddled with him. I figured if John had invited him, he must be ok - and I knew that he'd done the 244km PE to EL challenge in December last year. The first problem was that we weren't prompt about leaving. A couple of the guys arrived a few minutes late, then we had wasted time sorting out which vehicles were going to carry which skis, and the upshot was that we got on the water at 17:20, twenty minutes later than we had intended. The second issue was that although Gordon is normally very confident on the Millers run (and did a number in much more hectic conditions when he was training for PE to EL), he had a new boat about which he was slightly apprehensive, and he hadn't paddled on the sea for a couple of months. This made him tentative in his paddling and he felt unstable. Conditions at Millers Point itself were relatively mild but were more challenging outside the little bay where the swell was large and breaking, with cross chop making for confused seas. The swells were not breaking on the ramp as they had done on the day before and the wind was also less strong. We set off for Bakoven Rock (the turning point to go downwind) and the three of us waited for John and Gordon. After some minutes, we turned around to see that Gordon was off his ski, some 200m inshore of Bakoven Rock. John was with him, and as I paddled towards them I saw that Gordon was back on his ski and that John was paddling fast out to us. When he got to us he said that Gordon was feeling a bit tippy but that he, John, would stay with him. But further out to sea it was a bit more frenetic. With that, we all turned around to start the run. But Gordon was out of sight having already started. We spread out, hoping to see him. From my GPS track I can see that we went about 500m then stopped to look; another 500m or so and then we stopped for some minutes to discuss what to do. John said that he'd paddle back upwind to Millers Point and then sweep back close to the shore and that if it looked as though it was getting very late he'd get out at Simonstown. The three remaining paddlers spread out, with me taking an inside line, Simon in the middle and Damian on the outside. We were a couple of hundred metres apart and swept down towards Fish Hoek, arriving there at 6:25. I immediately called the NSRI to let them know that we were one paddler short and that we might have a bad situation on our hands. Darren immediately alerted his crew who started congregating at the Simonstown NSRI station. We started trying to contact John and sent his wife around to Simonstown in case he and Gordon had come in there. Gordon later confirmed that we were quite far seaward of him when we passed. Shortly after that he fell off again and then he couldn't get back on. He blew his whistle but none of us heard it. When John went back to look for him, he went inshore to within 200m of the boat ramp to the north of Millers Point and then swept back. He must have passed very close to Gordon who by then was in the water. Neither of them saw the other. 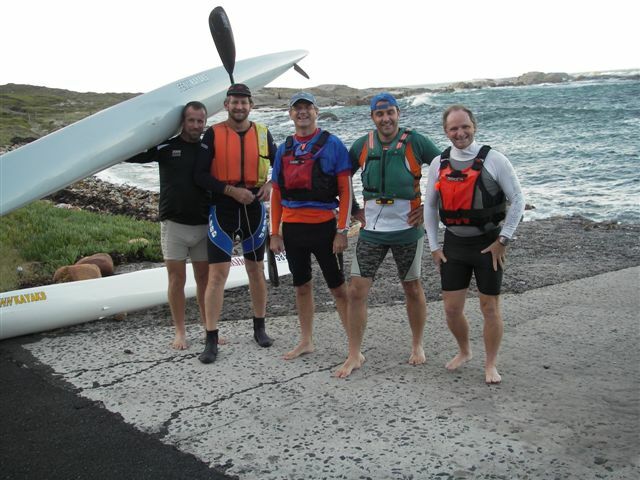 John then paddled all the way to Fish Hoek, arriving some 15min after the rest of us. Around this time Darren called me back to say that a member of the public had phoned into the NSRI to report that a flare had been fired out to sea, between Millers Point and Simonstown. The NSRI immediately launched their two boats. Gordon fired his first pencil flare (of three) when it was dark, popped another about 30 minutes later, saving the last one for when he could see his rescuers. The NSRI shore crew arrived opposite his position and he could see the flashing lights on their vehicle - he fired his last flare and he saw them flash the vehicle's headlights back to him and knew that they had seen the flare. By this time John and I were at the Simonstown NSRI control room, listening to the radios as the shore team attempted to direct the boats to where the flares had been fired. Finally came the call, "we can hear his whistle," and I breathed a massive sigh of relief. But... two minutes passed, then five. "We can't hear the whistle any more," came the report. That was one of the worst moments of my life. After some more fruitless searching, and much discussion, the NSRI team decided that Gordon must be near shore. If he had come ashore though, the danger of his being hypothermic would actually have increased because of the howling wind blowing on his wet clothing. They started to organise groups to search the beaches, and John and I drove to join the shore team. My heart sank still further when I arrived. The wind had strengthened and I could see the tiny lights of the search vessel as it plunged up and down the waves about a kilometre off shore. How could they possibly find someone in the pitch darkness in that maelstrom? Then I had a call from Craig Lambinon, the NSRI's media liaison officer. "Has anyone contacted Gordon's family?" he asked. "Someone's just called News24 to say that two paddlers are confirmed drowned." No, we hadn't called his family, we didn't have their number. I called John who had gone to fetch Gordon's car from Millers Point and he began searching through the contact list on Gordon's cell phone. One of the NSRI guys looked up from his radio. "It's OK," he said. "We've got the police chopper on the way. They've got a FLIR (Forward Looking Infra Red) scanner and they'll pick him up in no time." We heard later that the helicopter had been undergoing maintenance and the pilots were off duty. On hearing what had happened, the engineers had reassembled the aircraft in record time. Groups were setting off to start searching the shoreline, when suddenly, out of the darkness loomed the bearded shape of Gordon himself. He'd managed to swim with his ski to shore, had run up to Main Road and thumbed a lift to find us. He'd been in the water about 2 ½ hours. 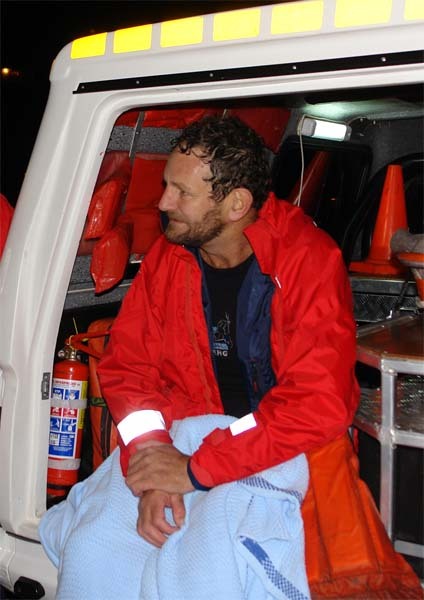 Gordon reckons the NSRI boat passed within 20-50m of him when he was blowing his whistle. Its searchlight had passed right over him. When the boat carried on searching upwind, he realised that he had to help himself and he carried on swimming his ski to shore. Gordon is a very experienced spear fisherman who has spent many, many hours swimming in that very area. He said that helped him not to panic. In fact given the warm 18.5C water, the only thing that really worried him was the possibility of sharks. In marginal conditions (e.g. late in the afternoon), never take ANYONE with whom you haven't done a recent run - i.e. whose current capabilities you're not intimately aware of. Apart from anything else, it's not fair on them. Always, always carry a cell phone (or VHF radio). Gordon did everything right (had his leash, had flares and used them properly, had a PFD, had a whistle) and still couldn't be spotted. He said he doubted whether he could have made a call with his cell in the conditions, but, thinking about it, we could have called him. It's a lot easier to receive a call than to make one. One of the moving aspects of this incident was seeing the volunteers of the NSRI all doing their utmost to help us - and being so darned nice about it. A heartfelt thank you to all of you. We hope to do an exercise in June with the Simonstown NSRI to try to prove (or disprove) some of the theories and suggestions about what rescue kit one should use in extreme conditions. For example we'll actually practise make calls on a cell phone and directing the rescue boat. If the conditions are right (i.e. some wind and waves) we'll measure how fast a ski drifts downwind with a paddler hanging over the side (any volunteers?). We'll film what happens when a paddler lets the ski go - to show just why a paddle leash is important. With any luck we'll combine the fun with getting some really useful information.